The theme for the Disability Blog Carnival #59 is Work and Disability. It’s National Disability Employment Awareness Month. Thank you to Penny from the Disability Studies Blog for co-ordinating the Disability Blog Carnival through 60 issues! Thank you all for your contributions! All through October, they buoyed me up and gave me food for thought. I felt intense pride to be part of this very loosely knit online community of thinkers and writers. The next Disability Blog Carnival will be hosted by the fantastic group blog FWD/Forward: Feminists With Disabilities. Wheelchair Dancer contributed two posts. In Becoming Disabled On the Job she writes about how even in a supportive workplace there were many obstacles to overcome as her physical capabilities changed over several years. Ultimately, I was successful at my job; I wrote my heart out, presented, won awards, grants, and funding; I got myself published. Technically, however, I didn’t get my work done on schedule; in fact, it took me approximately two extra years to approximate a body of work like the ones that my peers had on their resumes. I felt like that broken and imposter racehorse, uselessly gimping around behind its pure blood, beautiful, swift sisters. Her other post, Disability at Work, focuses on her current job as a dancer, where she is not the only person with a disability! “You know that disability is an important factor in your work environment when . . . ” Ha! I love it! I’m printing out her 10 reasons why list and putting it up at my office! Sophia from ‘sprokenword has an otherwise excellent post which does contain some hatred expressed towards people riding airport motor transport carts who are fat. If you can read around that or bracket it, read on because the post explores some other important issues. In Disability Employment Awareness Month, Sophia describes her job working for a non-profit open source software company while dealing with gait problems, chronic pain, trouble standing, and difficulty walking. Her situation requires quite a lot of travel. I enjoyed this post and have a lot of respect for the difficulties of travel and Sophia’s determination to do it. Sophia’s post and Wheelchair Dancer’s first post spoke to many of the issues that people with disabilities and chronic pain face in professional careers. Alison Bergblom Johnson, from the blog Writing Mental Illness, posted about poetry as work. Anne Sexton: Patient or Poet. Anne Sexton was a brilliant and hard working poet. She won many awards, including the Pulitzer Prize. But in the psychiatric professions she is a patient and her work is considered as pathology – as evidence of her illness. Deborah Kaplan wants to recognize the ways that her job is awesome in working while disabled: it’s really just fine. “I could do most of those infamous “activities of daily living” without help if I had too (since I don’t think that Congress defines “open-source coding and checking my feeds” as an activity of daily living). But without adaptive technology, I would not have been able to hold a job for the last 10 years, full stop.” Her co-workers and employers are supportive. She has some complicated stuff to say about the tradeoff between working through pain and difficulty vs. taking time off and trying to heal and avoid stress. In all that complexity, though, her day to day experience of work is “pretty damn good”. 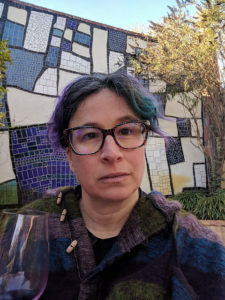 Sashafeather’s post, “Disability and Work: What I do” centers on Ursula K. Le Guin’s science fiction book about an anarchist planet, The Dispossessed, where the word for work is the same as the word for play. Sashafeather describes work/play as “what occupies a person’s time, and what one does with the people in one’s community”. She does emotional work, self care and pain management, volunteer work for the WisCon feminist science fiction convention, and disability/anti-oppression activism. She moderates several online communities and does creative work in media fandom. Her post made me think about self-care and pain management as an important part of community work. It’s something I have to remind myself of: If I don’t deal with my physical pain levels, I will be less useful to the people around me and my community. You might think the motivation of “not being in so much pain” would be enough. Often it’s not. I have personally benefitted from the feminist idea of work being a socially constructed idea, and “women’s work” such as housework, childcare, and care of the elderly and ill being often unpaid or underpaid and devalued by society. The reason women are paid less than men is because women’s work is undervalued. Women often provide emotional support for others, they build friendships, they build communities, they build homes. All of this takes time and effort. The categories of women and disabled people intersect hugely. The work of disabled people is also devalued, and disabled people face huge barriers such as pain, exhaustion, mobility and cognitive impairments, communication differences, discrimination in the work place and the wider world, and a lack of basic access to buildings, services, and transportation. Eva from The Deal with Disability wrote and posted a video of herself at her dogwalking job. Sometimes accessibility is more than meets the eye. She posts flyers for her business at veterinarians’ offices and was showing how though she found out she couldn’t get into the office there, the staff’s attitude was polite and helpful. Eva goes on to point out factors other than steps or ramps that affect accessibility. The spaces in my résumé by codeman38 talks about some of the practical difficulties in getting a job by traditional means. Interviews, transport, and phone calls are not completely impossible for him as an autistic person but they are definitely obstacles. He finds jobs through friends and family. Tera from Sweet Perdition writes about her job at a local game store: I am Lord Voldemort. She works for store credit at a job that her college professors would consider below her capacity – but she loves her work and their appreciation of her. ize that you don’t really want a lot of things that you’ve grown up hearing independent adults must have . . . But all this guilt is just society’s poison coursing through your brain; it isn’t you. The things you want–really want, not just think you should want in order to be a real person–are not the things your culture wants for you. Popular culture doesn’t have many models for the kind of person you are. Cheryl from Uppity Crip has two posts to contribute. Heads up that her blog has music on auto-play. 51% of Workplace Accomodations Cost Nothing and Mental Illness is Still a Big Stigma. I posted on BlogHer.com on Working Women With Disabilities. I was feeling exhausted and disheartened, and wanted to see other people’s thoughts on working and being disabled. My own thoughts on the subject are going to take me a while to put together. When I post about my personal experiences with losing jobs, struggling to get SSI, working part time, passing as able, going back to school, and access issues on the job now that I’m working again. I’ll link to it from the comments on this post. Wheelie Catholic posted many times in October with Disability Awareness Month in mind. Her posts are great! * National Disability Employment Awareness Month: What Can We Do? * Disability Awareness FAIL – this one is hilarious and awful! * Video Post from Bev from Asperger Square 8. Thank you all again for clueing me in to your amazing writing. And thanks for reading! Please stay tuned to FWD/Forward for the next Disability Blog Carnival call for contributions for Carnival #60! Whoo-hoo! The Disability Blog Carnival is kicking again, and this is an especially kicking edition. Thank you, thank you, for the WORK this represents and to all the contributors for such thoughtful writing. Thanks so much for coordinating these great pieces on an oh-so-important topic – I look forward to reading those I missed. yee haa, Liz!! the carnival is going. and this is a good one — so much to read. thanks for doing this. Thanks for the carnival. Could you maybe put a warning on the sprokenword post for the hate expressed in it for fat scooter users? Thanks. Thanks lauredhel, I regret not putting a note on that link beforehand. I prefaced the link with mention of that issue. Thank you, Liz, for coordinating this iteration of the carnival, and for your lasting & effective commitment to making communities happen! I've been really low on physical energy but wanted to say how much I enjoyed reading these–this is a great collection. Thanks so much for running the Disability Blog Carnival! Work and Disability is much on my mind this month, and these posts have given me a lot to think about. I'd like to call your attention to an interesting side-effect of a trigger-warning you posted, though. Lauredhel characterized Sophia's post at sprokenword as containing "hate expressed in it for fat scooter users". (The exact sentence was: "Watching obese people riding carts through the airport while I hump it between gates annoys me.") So I would say that there was annoyance expressed, and that this was one sentence in a deeply personal, incredibly moving post. Sophia talks about her mobility problems, and explains, "The pain is bad enough for me to consider having my [lower] limbs removed." Lauredhel asked you to mark the post as expressing "fat hatred", and you were kind enough to Lauredhel to comply; I don't fault you for doing so at all. However, this tagging means that readers are now reading the Carnival and then going over to comment on the post merely to chide Sophia for insensitivity. I'm fascinated by this outcome. I see the value in watching our online speech so that those who are sensitive are not accidentally offended; however, the value in Sophia's challenging post is getting lost. Rose: okay, that's certainly not a good outcome. I found Sophia's post moving and thought provoking on many levels. And I admire her frankness. Now, we all have to deal with the concept of comparing our toughness or levels of accepting help or not. I have to say reading Sophia's post I felt somewhat ashamed and that she would likely judge me harshly for my wheelchair use in a situation when she might just hump it. I can take that thought from another person in pain and dealing with disability better than i can take it from another person. I wonder all the time whether I'm trying hard enough. Now, I end up in a place where I say, you know what, I need the chair in order to do what I want to do. But her post also was a frank exploration of her own discomfort with the idea of being seen as disabled rather than being able to pass, as she does now. The idea of putting a warning on the link for bigotry towards fat people seemed sensible to me, because, i read it as bigotry, ie. as judging that someone heavier was at fault for their own disability. I guess I could call that bigotry rather than hatred. But I did not want to suggest that we all pile onto a person and critique them. The point was made once. Maybe let her process that at her own pace. Or approach it as education rather than criticism. It is good to point out instances of bigotry when we see them. We all have a lot to deal with including our own internal oppressions. And I want Sophia's story appreciated. As I would want all our stories repsected despite our flaws and that we offer each other as much solidarity as possible. In this case I probably should have realized as well that it was opening up Sophia to some anger and I could have privately written her to ask her to change that wording on the post. I was not too careful there and I apologize for not being a thoughtful moderator in this case. Thanks for posting all these links. I look forward to reading them. This post has been included in a linkspam round up. I am very impressed with this revived carnival edition. Excellent 'job' putting it together! Other blogger blogs allow me to delete my comment, but I don't see that option here. If it is only under your options, how 'bout deleting that spam one? Thanks.